Fig. 1. 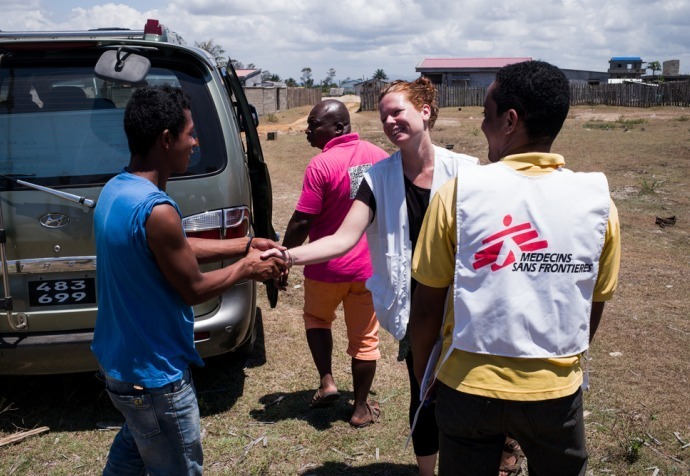 Madagascar Plague Intervention by MSF. Fig, 2. 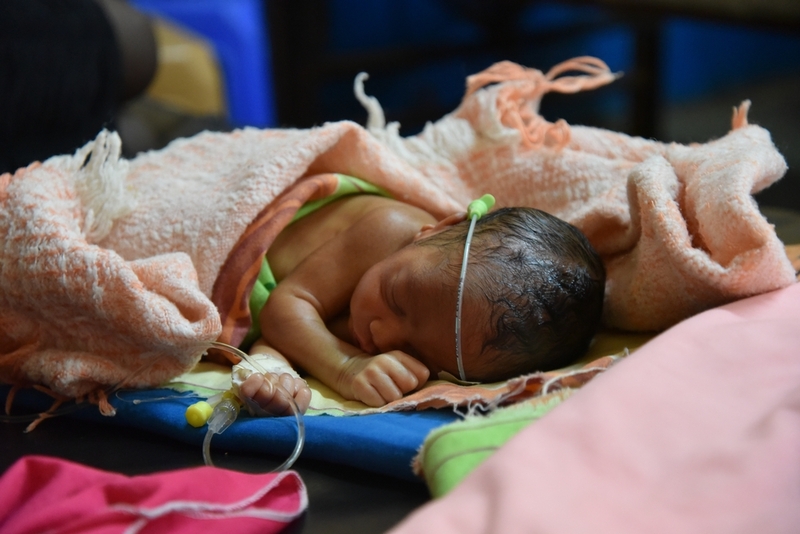 Infant in Nigeria being cared for by MSFA. Medecins Sans Frontieres Australia (MSFA) is a Not for Profit (NFP) organisation (a subsidiary of the international Medecins Sans Frontieres), it is an independent association of “mainly doctors and health sector workers”, which provides humanitarian assistance to populations in distress globally. In this Brand Audit Report, the analyst will identify the current positioning of the brand, its strategic target market, the nature of its competition, and draw conclusions based on this evaluation, which may present issues to be noted and opportunities to be addressed. Background: MSFA was established in 1994; it has a ten-person constituted board, who are all volunteers. The MSF charter observes “neutrality and impartiality” under universal medical ethics, to offer assistance to populations of human beings who are victims of disasters and conflicts, without discrimination and regardless of “race, religion, creed or political affiliation”. The independence of the parent organisation and its Australian subsidiary is an important core brand value. MSF was founded in 1971 by doctors and journalists in France in response to war and famine in Biafra. In 1999 MSF received the Nobel Peace Prize. All donations to MSFA over $2 are tax deductible in Australia. MSFA generated $88.3 million through fundraising activities in 2016. MSFA is a registered Australian Public Company, registered for the GST from 1st July 2000, it is located in NSW, 2037. It has been registered with the Australian Charities and Not-for-profits Commission since 2012. MSFA is a Public Benevolent Institution with GST Concession, FBT exemption, and Income Tax Exemption. MSFA Overseas Fund has Deductible gift recipient status since 1st July 2000. The MSFA brand focus has been diversified in recent years, with increased lobbying of governments and pharmaceutical multinationals in the wake of the Ebola crisis in Africa and other disaster relief crises globally. The focus, remains fund raising for disaster relief; with the induction of volunteer and paid workers a strong secondary pursuit, which is integral to their model of western health workers providing care for those in desperate need wherever they are. 2.1 Core Brand Values: “Core values rooted in the value foundation of the organisation are beacons in the management of a corporate brand”. Core values are particularly important in the charitable NFP sector, this area is increasingly scrutinised by ‘would be donors’, before they bestow their funds to charitable organisations. The tone of the charter must strike the right chord, and the activities of the organisation must reinforce this every step of the way. Urde points out that identifying a cogent narrative within a corporation’s core brand values is, often, no easy task. He breaks these into three groups of values: a. those related to the organisation, b. which summarise the brand, c. are experienced by customers. The independence of MSFA from any religious, national or political affiliation is a clear organisational core value. That the foundation of the MSFA brand is, ‘doctors treating those in need free of charge’, summarises the brand. The values experienced by their donors (called Field Partners) are centred around a shared social conscience and the ability to contribute positively to the alleviation of suffering through their donations to MSFA. Financial sustainability and transparency are integral aspects of all charitable brands in the minds of their customers/donors. 2.2 Brand Elements: or Identities, are those “trademarkable devices” which allow customers to perceive and differentiate one brand from another. The logo is an important visual identifier of brands, which may involve: name, sign, design, symbol, or a combination of these. Fig. 1. MSF distinctive logo, depicts a symbolic stick figure crossing borders. The logo pictorially suggests risk and bravery on behalf of the figure, who represents the ‘good doctor’, he or she is balancing/risking the value of their own life against the lives of those in desperate need of medical assistance in potentially unsafe territory. Red, black and white are bold colours, which are a call to action. Red symbolises high alert and blood. A new take on the Red Cross, springs to this analyst’s mind. MSF’s Dr Bernard Kouchner witnessed atrocities committed by the Nigerian government in the 1960s and the International Red Cross’s policy of not publicly commenting on them. MSF was born out of a passionate realisation that ‘outspokenness’ is an essential quality for emergency relief organisations. The name of MSF is important to its brand identity, it is immediately recognisable by the French sounding name. Its distinctiveness is a Point of Difference (POD), but also presents challenges to the brand. ‘Medecins Sans Frontieres’ can be translated from the French as ‘Doctors Without Borders’, and the use of this English translation has been important in the global branding of MSF. The U.S. version of the group, MSF USA employs http://www.doctorswithoutborders.org/ , as its URL. Tricky to pronounce French words, can be a marketing hindrance, as donors do not like to be embarrassed by incorrect pronunciation and may choose a charity with a more easily pronounceable name to donate to. The brand image and personality of MSFA is one of brave doctors cutting through the administrative international ‘red tape’ to reach those in need of medical assistance. MSFA takes the higher moral ground via their sincere commitment to relief work; and brand personality has been proven to engender strong customer loyalty. Westerners, generally, trust their doctors; this is an important key brand element here. 2.3 Brand Communication: The digital age has thrust a brand’s communications into 24/7 overdrive, with social media platforms joining websites as portals that never sleep. MSFA’s front line employees are, both, those who administer the charity and those who work in the field providing relief and medical aid. MSFA as a brand is constantly evaluated on the basis of the actions of these people. “Recent empirical evidence” has shown that the strategic alignment between frontline employee behaviour and the brand’s core values reinforces brand meaning with consumers. In the NFP sector an organisation lives and dies by its people and its track record; MSFA upholds exemplary standards in this area of brand communication. Social media allows MSFA to have conversations with their network of supporters globally. MSFA promotes its website through Google AdWords and this focus is on the ‘Donate Now’ page. I used the online facility at https://www.msf.org.au/donate-now to make an arrangement to donate money every month. It was quick, easy and immediately produced a ‘thank you’ notification and an email follow up. Fig. 3. Image taken from MSF Australia Twitter account. 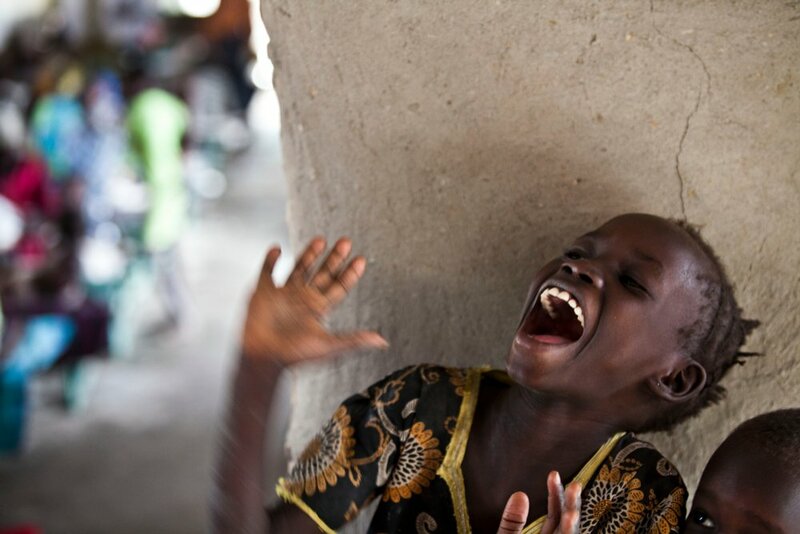 MSFA promotes images on their website of malnourished children receiving much needed treatment from MSFA health workers in third world conditions. Their website’s provocative photographic images are linked to articles addressing the current activities of the relief organisation in various war and disaster zones. Their digital presence is full of information and potentially inspirational content! This website article heading is specifically designed to frame an aspect of the crisis, using references understandable by the target audience – Aussie donors. 2.4 Secondary Brand Associations: The lobbying activities of MSF can be viewed as a secondary brand association. These political stratagems are only indirectly related to the group’s primary charitable relief work. MSF has made a number of bold and controversial moves in the global humanitarian political sphere, with an exit from the UN – backed World Humanitarian Summit in 2016, being one such action. MSH hospitals have been bombed by U.S. military forces in Syria and Afghanistan. Their ongoing battle with pharmaceutical multinationals over the prices charged for medicines has, also, attracted worldwide press. Disagreements with the Australian Government over the handling of the Ebola crisis in Africa has seen MSFA reject government aid money and demand Australian doctors be sent to West Africa instead. These forays into international affairs and the world media have not damaged the brand, quite the reverse, they have strengthened the consumer perception of the organisation’s independence and outspokenness. In today’s competitive market, brands must position themselves distinctly in the minds of their consumers to maintain and grow themselves. MSFA carries a clear perceptual difference, with its ‘independent and outspoken’ emergency relief fund brand a POD. The last 10 years has seen Australian governments reduce spending on foreign aid, and more closely link aid with political and international policies. Perceptions of this within the Australian population can increase the perceived value of organisations like MSFA, especially at times of international crises. The MSFA brand image has appeal to the tertiary educated, ABC watching, demographic within the Australian community. Google searches of the terms: ‘emergency relief fund’; ‘relief fund’; emergency relief donations’ and ‘disaster relief fund’, did not generate any organic SEO or AdWords results for MSFA on the first 5 pages. A search via majestic.com, ranks the links on the MSFA website with a Trust Flow of 51 and Citation Flow of 41. This evidence points to no current effective organic SEO; and no positioning of MSFA as a charity of this kind through digital marketing. Competitors like Red Cross Aust., UNICEF, Oxfam, WVA and STCA all rank on the first page for these keyword terms. MSFA AdWords’ campaign has been targeted to specific crises via keywords like ‘Rohingya Refugee Crisis’; ‘South Sudan donate’; and ‘Syria Crisis’. The MSFA constraints on their fundraising budget to just 19% of revenue, would limit their marketing spend for things like organic SEO. Australians gave around $12.5 billion in individual charitable donations in 2016, with the average donation being $764.08; this is the current total target revenue market for groups like MSFA. Emergency relief fund donations were $949 million in 2012-13. Its main competitors, with which it shares general POPs, are organisations like Save the Children Australia (STCA), World Vision Australia (WFA), UNICEF Australia, Australian Red Cross and Oxfam Australia. All of these organisations operate relief funds for international crises and they have their own field workers on the ground in these war and disaster zones. Interestingly, MSFA, STCA, and Oxfam all generated around $90 million annually in 2016, according to figures provided by www.changepath.com.au. WFA Aust. generated around $435 million, Aust. Red Cross $894 million, and UNICEF Aust. $30 million. Strengths – Emerging as a strong NFP brand in the Australian market, with its fierce outspokenness and independence appealing to a younger demographic; which should anticipate revenue growth, if MSFA can hang onto these supporters as they age and increase their wealth. Its high media profile is a strength, but can turn into a threat if any hint of mismanagement or corruption was detected. 81% of their revenue is spent on their relief work, with just 19% paying for fundraising and administration. Oxfam’s figures in 2016-17, reveal their fundraising and administration expenditure percentage is much higher at 32.8%. Digital marketing has been a huge windfall for charitable organisations, contributing to much lower fundraising costs. Weaknesses –In 2012, MSFA made a loss of some $2.45 million; and it has asset cover for only 3 months of operational expenses (which is industry standard). WFA has made losses in 2013 and 2015; Red Cross in 2015; and STCA in 2016. There is homogeneity in brand perception in this NFP relief fund sector, with Oxfam, WVA, and STCA employing similar images of starving Africans on their websites and in their advertising. The danger has always been target-market desensitisation from over-exposure to coverage of these crises in the media. Opportunities – The increasing materialism prevalent throughout western cultures, and the decline in religious life, will continue to spur a desire among a section of the population to devote their lives to meaningful and altruistic activities. MSFA is ideally placed to benefit from this trend, to increase the scope of their field work globally. Doctors and healthcare workers are relatively free of the taint of sexual abuse, which has permanently damaged religious persons in western perceptions. The new saint wears a stethoscope! Threats – MSF hospitals being bombed in war zones, can, potentially, have negative effects on staff recruitment, operations and donation revenue. It is a Nobel Peace Prize winning brand; rolled gold in NFP terms. MSFA’s passionate and outspoken profile, continually raises awareness of the organisation’s relief work; offsetting the need for costly advertising. As a NFP brand in this sector, MSFA are less than 25 YO, which is relatively young in comparison to the Australian Red Cross and Save the Children brands. Their image is one of doctorly dedication, despite the dangers and political heat within these war and disaster zones. Their appeal, to both volunteers and donors, will only increase in this materialistic world; as they polarise this position. Donor surveying may provide useful brand perception information to hone further effective marketing strategies. The conquest of the airwaves and media by the digital world, ideally places NFPs in the phones and living rooms of Australian consumers, especially during times of heightened action. Social media platforms are an important part of this, and an expansion of this activity would prove fruitful. Fundraising revenue growth remains the branding strategy’s main target. ABC News, “Doctors Without Borders pull out of UN aid summit amid ‘no hope’ of pressuring governments”, (5th May, 2016), retrieved from http://www.abc.net.au/news/2016-05-05/msf-pulls-out-of-un-backed-aid-summit/7389008 , Viewed 15th November 2017. Australian Bureau of Statistics, “Year Book Australia, 2012”, retrieved from http://www.abs.gov.au/ausstats/abs@.nsf/Lookup/by%20Subject/1301.0~2012~Main%20Features~Where%20we%20give%20aid~218 , Viewed 18th November 2017. Australian Government, Australian Business Register, “ABN Lookup”, (9th September, 2016), retrieved from https://abr.business.gov.au/SearchByAbn.aspx?abn=74068758654 , Viewed 16th November 2017. Baker, Thomas, “The role of brand communications on front line service employee beliefs, behaviors, and performance”, Journal of the Academy of Marketing Science, Vol. 42, Issue 6, pp 642-657. ChangePath, (website), retrieved from http://www.changepath.com.au/medecins-sans-frontieres-australia- , Viewed 15th November 2017. Charity Navigator, “Doctors Without Borders, USA”, (3rd January, 2017), retrieved from https://www.charitynavigator.org/index.cfm?bay=search.summary&orgid=3628 , Viewed 16th November 2017. Cheskis, Andrew, “What’s your brand? Winning internal audit brands are those that are designed proactively instead of happening by default”, Internal Auditor, Vol. 69.5. p 58. Cohen, M, “Medecins Sans Frontieres”, in International Directory of Company Histories, Vol. 85, Encyclopedia. Com, retrieved from http://www.encyclopedia.com/social-sciences-and-law/political-science-and-government/international-organizations/doctors , Viewed 18th November 2017. Dall’Olmo Riley, Francesca, (ed. ), The Routledge Companion to Contemporary Brand Management, (2016). Dunlevy, Sue, “Medecins Sans Frontieres slams Australia’s Ebola response”, News Corp Australia Network, (17th September, 2014), retrieved from http://www.news.com.au/national/medecins-sans-frontieres-slams-australias-ebola-response/news-story/b7137bc1f24c90a0c96022e585b23e2f , Viewed 15th November 2017. Even J. Lanseng, “Effects of Secondary Associations on Brand Value: a Study of the Relationship Between Corporate Image and Consumers’ Willingness to Pay”, in AP – Asia Pacific Advances in Consumer Research, Vol. 6, p 155. Google, Search, “emergency relief donations”, retrieved from https://www.google.com.au/search?biw=1440&bih=794&ei=IzkSWuOWOsLy8QXb8KDQDw&q=emergency+relief+donations&oq=emergency+relief+donations&gs_l=psy-ab.3..0j0i22i30k1l2.10849.13830.0.14174.13.11.0.0.0.0.327.1460.2-3j2.5.0….0…1.1.64.psy-ab..8.5.1459…0i67k1.0.e6XX3GFrlnw , Viewed 19th November 20-17. Hamblin, James, “Why Doctors Without Borders Refused a Million Free Vaccines”, The Atlantic, (14th October, 2016), retrieved from https://www.theatlantic.com/health/archive/2016/10/doctors-with-borders/503786/ , Viewed 15th November 2017. House of Kaizen, Digital marketers, retrieved from https://www.houseofkaizen.com/digital-marketing/clients-and-case-studies/msf , Viewed 12th November 2017. Keller, Kevin, “Conceptualizing, Measuring and Managing Customer-Based Brand Equity”, Journal of Marketing, Vol. 57, No. 1, pp 1-22. Keller, Kevin, Strategic Brand Management, (Global Edition, MyiLibrary, 2103). Lawrance, David, “How charities can make better used of social media”, The Guardian, (28th February 2013), retrieved from https://www.theguardian.com/voluntary-sector-network/2013/feb/28/charities-social-media , Viewed 19th November 2017. Majestic.com, SEO checker, retrieved from https://majestic.com/reports/site-explorer?q=www.msf.org.au&oq=www.msf.org.au&IndexDataSource=F , Viewed 19th November 2017. Medecins Sand Frontieres, (website), retrieved from http://www.msf.org/en , Viewed 6th November 2017. Medecins Sans Frontieres Australia, (website), retrieved from http://www.msf.org.au/ , Viewed 5th November 2017. MSFA on Facebook, retrieved from https://www.facebook.com/msf.english/, Viewed 19th November 2017. MSFA on Twitter, retrieved from https://twitter.com/MSFAustralia?ref_src=twsrc%5Egoogle%7Ctwcamp%5Eserp%7Ctwgr%5Eauthor , Viewed 19th November 2017. Oxfam Australia, “Annual Report: 2016-2017”, retrieved from https://www.oxfam.org.au/what-we-do/about-us/assessing-our-performance/annual-report/ , Viewed 18th November 2017. Philanthropy Australia, “Fast facts and statistics on giving in Australia”, retrieved from http://www.philanthropy.org.au/tools-resources/fast-facts-and-stats/ , Viewed 14th November 2017. Pryke, Jonathan, “Australian Foreign Aid”, Lowy Institute, retrieved from https://www.lowyinstitute.org/issues/australian-foreign-aid , Viewed 19th November 2017. Robinson, Belinda, “Data Snapshot 2017”, Universities Australia, (Deakin, ACT, 2017). Seimiene, Eleonora, “Effect on Brand Elements on Brand Personality Perception”, Procedia – Social and Behavioral Sciences, Vol. 156, pp 429-434. The Telegraph, (Telegraph reporters), “ ‘Starving’ Africa images are counterproductive, says Oxfam”, (26th December 2012). Urde, Mats, “Core value-based corporate brand building”, European Journal of Marketing, Vol. 37, No. 78, pp 1017-1040. Von Mittelstaedt, Juliane, “Saving Lives at the World’s Most Dangerous Border”, Der Spiegel Online, (13th August, 2015), retrieved from http://www.spiegel.de/international/world/alongside-doctors-without-borders-in-the-mediterranean-a-1047535.html , Viewed 16th November 2017. Waugh, Auberon, “Britain and Biafra: The case for genocide examined”, The Spectator, (27th December 1968), retrieved from http://archive.spectator.co.uk/article/27th-december-1968/10/britain-and-biafra-the-case-for-genocide-examined , Viewed 14th November 2017. World Vision Australia, retrieved from https://www.worldvision.com.au/docs/default-source/school-resources/government-aid—who-gives-aid-and-how-much-(updated).pdf?sfvrsn=0 , Viewed 18th November 2017. MSFA, “Our Board”, retrieved from http://www.msf.org.au/our-board , Viewed 7th November 2017. MSFA, op cit, “Our Charter”. MSF, “MSF History”, retrieved from http://www.msf.org/en/msf-history , Viewed 7th November 2017. Urde, Mats, “Uncovering the Corporate Brand’s Core Values”, Management Decision, Vol. 47, Issue 4, (2009), p 617. Urde, Mats, “Core value-based corporate brand building”, European Journal of Marketing, Vol. 37, No. 78, p 1018. Keller, Kevin, Strategic Brand Management, (Global Edition, MyiLibrary, 2103), p 142. De Chernatony, Leslie, “Defining A Brand: Beyond the Literature with Experts’ Interpretations”, Journal of Marketing Management, Vol. 14, Issue 5, p 419. Seimiene, Eleonora, “Effect on Brand Elements on Brand Personality Perception”, Procedia – Social and Behavioral Sciences, Vol. 156, p 430. MSFA on https://www.facebook.com/msf.english/, Viewed 19th November 2017. Baker, Thomas, “The role of brand communications on front line service employee beliefs, behaviors, and performance”, Journal of the Academy of Marketing Science, Vol. 42, Issue 6, p 642. MSFA, op cit, “Donate Now”. MSFA, https://www.msf.org.au/ , Viewed 15th November 2017. MSFA, op cit, https://www.msf.org.au/article/stories-patients-staff/bangladesh-%E2%80%9Cthey-build-shelters-material-aussies-would-use-bin-liners , Viewed 16th November 2017. Dall’Olmo Riley, Francesca, (ed. ), The Routledge Companion to Contemporary Brand Management, (2016), p 164. Robinson, Belinda, “Data Snapshot 2017”, Universities Australia, (Deakin, ACT, 2017), p 21. Google, Search, “emergency relief donations”, retrieved from http://bit.ly/2zVBLL1 , Viewed 19th November 2017. ACFID 2014 Annual Report, Financial Statements, p 22 in World Vision Australia, retrieved from https://www.worldvision.com.au/docs/default-source/school-resources/government-aid—who-gives-aid-and-how-much-(updated).pdf?sfvrsn=0 , Viewed 18th November 2017. MSFA, op cit, “Our Finances”. Changepath.com.au, “Financial Tables”, retrieved from http://www.changepath.com.au/save-the-children-australia , http://www.changepath.com.au/australian-red-cross , & http://www.changepath.com.au/world-vision-australia , Viewed 19th November 2107. The Telegraph, (Telegraph reporters), “‘Starving’ Africa images are counterproductive, says Oxfam”, (26th December 2012).